Bob sacked in on Sunday and didn’t get moving til around 9am. Can’t say that I blame him! Our agenda for the day was to check out the large chandlery in Nanaimo and then to scout out Newcastle Marine Park directly across from Nanaimo before heading south. It was a worthwhile decision to spend this extra time in Nanaimo. Usually we are simply heading north or south and had not taken the time to explore the area. The Chandlery was heaven for Bob, well stocked with all things marine and a wonderful place to find whatever is needed. What was needed for us was “head deodorizer”, the important chemicals you put into the holding tanks to avoid the nauseous sewage gasses that can arise when the toilets are flushed. What a difference that stuff makes to happy boat living! We went to lunch on the dock right near our boat, at a place called Penny’s Palapas. We had smelled the Mexican food from there all afternoon on Saturday, and finally caved in, expecting very little. It’s an open-air café on the dock, open sunrise to dusk, with a tiny kitchen. You order up at the “kitchen” and wait for the food to be delivered. How good could it be? It was superb. I had halibut tacos that were out of this world, and Bob had a chicken burrito that had him sighing with pleasure. Well fortified, I convinced Captain Bob to lower the dinghy so that we could go explore Newcastle Island Marine Park. 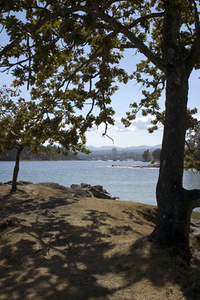 This is a 750-acre marine park that we had heard was lovely. It was just a quick dinghy ride from Nanaimo across the harbor to the park. Karen says "Hi" to the concierge at Newcastle Park. Needless to say, Newcastle lived up to its billing. There were wonderful campsites and picnic sites, and well maintained paths throughout the island. We “hiked” the shoreline trail that kept us in view of the water and views out across the Strait of Georgia. It was sunny and warm, and I had on my shorts for the first time all season. 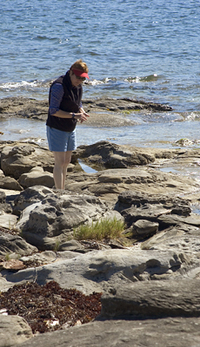 Karen hunting for the perfect shell at Newcastle. We spent a pleasant 90 minutes or so walking around this island. While we didn’t see any, the island is also famous for champagne colored raccoons. We saw a picture of them and they are really cool looking. Loooking back to Nanaimo from Newcastle Park. The term "beach" in B.C. most often refers to solid granite. Many of the granite "beaches" are lovely. 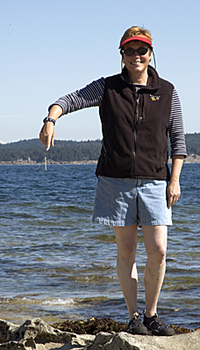 Karen points to the last visable sign of a sailboat that tried to take a shortcut into Nanaimo. Back across the bay and time to depart for the south, catching the slack tide at Dodd Narrows again. As we depart the harbor of Nanaimo, we spotted a Dockwise yacht transport vessel preparing to load its cargo. Yachts that is. Trawler waits its turn to "sail" into the Dockwise transport ship. The ship will flood its tanks, lowering itself about 16 feet. Then the "cargo" can float in. Once there, a cradle is placed under each vessel and the Dockwise ship pumps out its ballast tanks lifting the cargo out of the water, safe and secure for a long passage to another continent. It saves a long and possibly dangerous ocean passage for the smaller boats and is a popular way to reposition your boat for another season. Now, on to Dodd Narrows. It amazes us that so few boats take the time to announce their intentions at this narrow dogleg passage. It serves them all right if they meet a large boat head on in there. 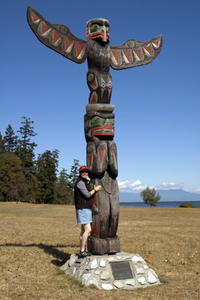 We, of course, followed proper protocol and soon were headed to Pirate’s Cove Marine Park on DeCourcy Island. We had planned to stop there on the way north, but the flood from the water tanks led us to overnight in Ganges instead. So we wanted to check this place out. It has a tricky reef-strewn entrance that, while well marked, gets your attention. You have to follow a range into the cove, and then hang a hard left to stay between two marks to avoid other shoals. Narrow entrance into Pirate’s Cove. A good look at the rocks that are marked by the channel buoys and why you must be careful and follow the course defined by the published entrance. We did that without a problem, but the cove was much smaller than we thought and it was crowded. We had to drop anchor before our stern tie equipment was ready, and we suffered for it. I think we entertained the entire cove with our shenanigans. I lost the will to explore and simply hung out in the boat for the evening. Bob made killer food, salmon marinated in honey and balsamic and sherry and Dijon…it was wonderful. A good night after all!